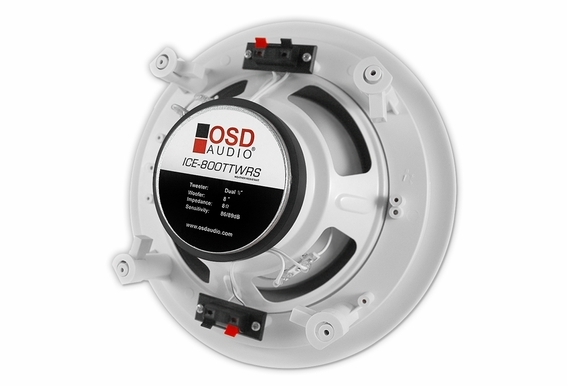 This powerful single speaker is a great way to add sound in areas where traditional in-door speakers wouldn't last. 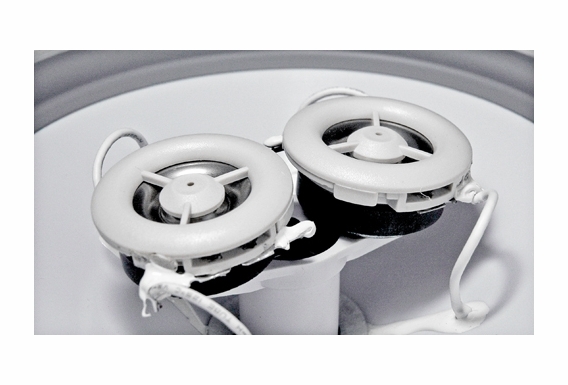 The dual voice coil design provides stereo sound within one speaker, making it a perfect choice for rooms that can't accommodate two speakers. 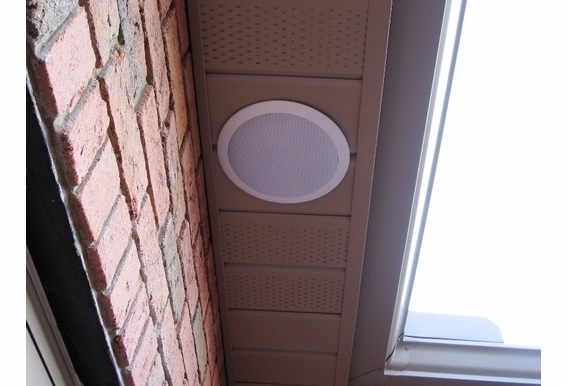 The grill is powder coated to prevent rusting in high moisture areas like bathrooms, laundry rooms and covered porches. In addition, the 8" polypropylene woofer, dual 1" polycarbonate tweeter system and 150W power handling work together to deliver beautiful sound. 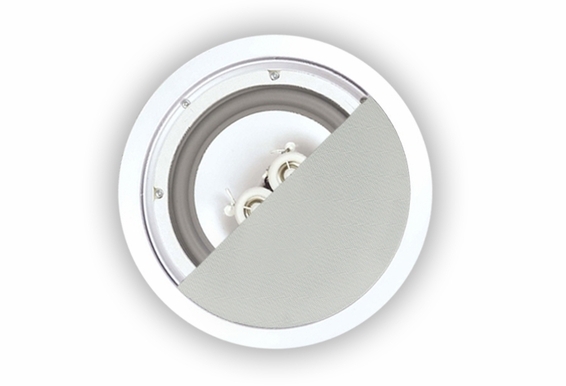 Diameter & Depth: 10 1/4" x 4"
8" Ceiling Weather Resistant 150W Water Resistant design which can be used in high humidity areas such as Outdoor patios, bathrooms or laundry rooms 10yr Warranty! Great for covered porches & patios! I have an 8 ohm receiver and I purchased two speakers. Is this the correct wiring pattern? These are two on my rear porch in the ceiling. 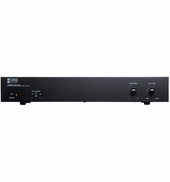 If I use a 2 channel amp connected to the ICE800TTWRS and then further connect (in parallel) an AP670's off each side of the ICE800TTWRS, I have 3 questions: 1) Will my AMP experience a 4ohm load? 2) Will my AP 670's keep their stereo separation? 3) Would Volume levels at the AP670 be impacted by this setup. See diagram for clarity. I have two of these hooked up currently. Unfortunately I only hooked up one side of each of these speakers and now Iâ€™m regretting it. Unfortunately it was a huge pain in neck to run the wire and I just canâ€™t do it again. My question is can I run a two wire cable from one speaker to the other, like a jumper cable? Would that work? Hello, Do you see any reason why I wouldn't install these indoor for main areas in my home? 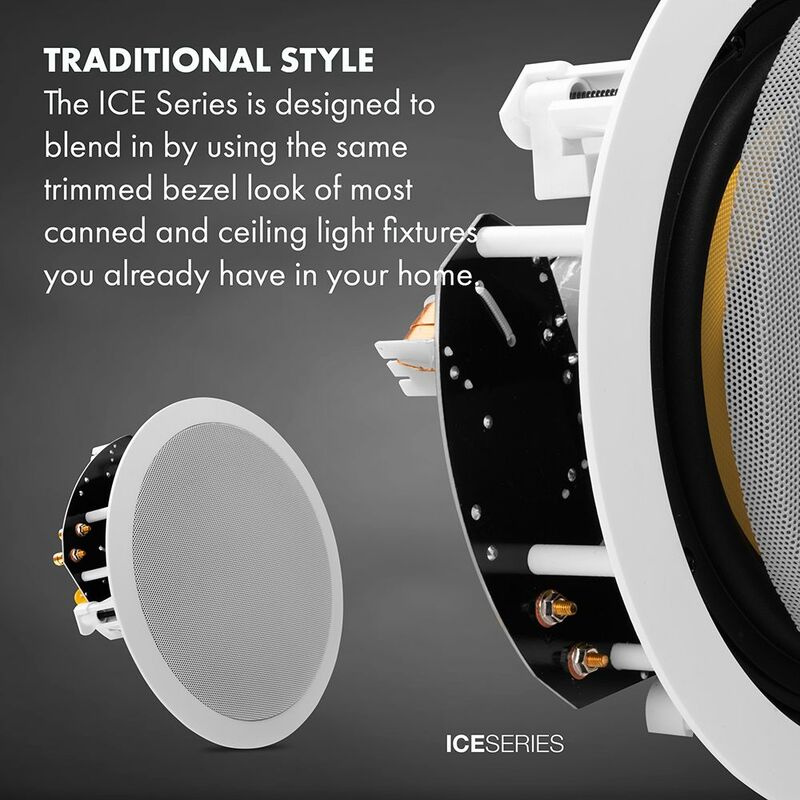 I am looking for 8" stereo speakers and the ICE840TT is currently out of stock and this speaker seems to be the same but it is weather proof? I really don't want the trimless so I didn't want to go with the ACE840TT. I was just worried that the sound quality would not be as good as the indoor rated. 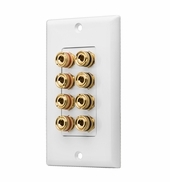 I have a master bath (spkr 1 & 2) and a Master Bedroom (spkr 3 & 4) that have both been pre-wired for sound. 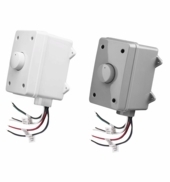 The two speakers in the master bath can be wired in parallel or in series as I have stereo running to each and two speaker cables running between speaker 1&2. Goal #1 I would like to have stereo sound out of both speaker 1 and speaker 2. 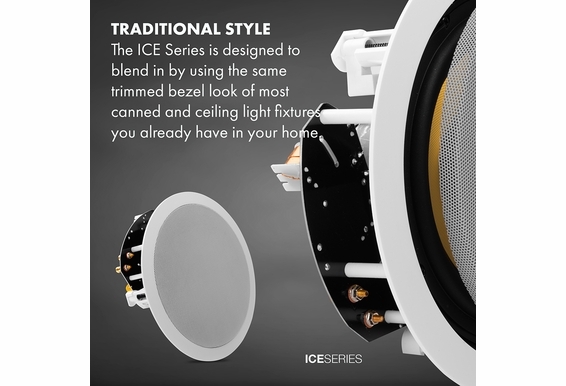 I’d like to use: ICE800TTWRS for these as the speakers are weather resistant and can be wired so both produce stereo out of a single speaker. I also like the fact that they are 8” cones so I may be able to get better base response. Goal #2 I would like to have 3 & 4 start life as stereo speakers over the bed, but then become rear surround sound speakers at a later date. Goal #3 I would like to run 1,2,3,4 off of a single amp to start. I would then like to have that amp become just the bathroom amp when I get a surround sound receiver. Questions: 1) Would AMP120 be able to run 1&2 in parallel at 4 ohms and 3&4 in stereo at 8 ohms simultaneously? 2) Does AMP 120 have enough power to push the 8” cones to drive some low end? 3) Should I go with the ICE800TTWRS for 3&4 in the master bedroom or is there another / better option for my goals of good stereo sound today and good surround sound speakers in the future Thanks! Mike P.
New to the speaker world....So I am installing a covered 13x36 gable style patio with a pool behind it in the yard. Want to have speakers in the ceiling . How many would I need in this area? I plan on having a Tv out there and would like to be able to have the volume play either over the tv or over the speakers. Also would like to play songs from iphone when needed. What kind of equipment will I need and how many speakers should I get? I would like to hear music while in the pool as well. I have purchased two of these. When I pulled them out of the box I realized that there are 4 inputs which I did not realize thats what dual tweeter speakers would do. I only have 4 spots left on my amp, which is two rights and two lefts. Do I just hook up to one set of inputs on each new speaker? Is there a way to run a jumper wire for each new speaker? Should I just get single tweeter speakers? Also if I have 2 of these plus 1 of the omni subs, plus two omni planters, what size amp do I really need? Thanks for all your help! Please help! I'm not that great at this, so this may sound like a dumb question. I just bought two of these and went to install and noticed they have 4 inputs, hence the dual voice. My amp has 4 spots total so two wires running to each speaker. Can I just hook up one pair to each speaker or do all 4 inputs need to be used?? 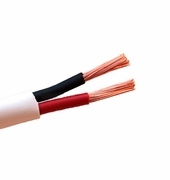 Can I use a wire to connect the two inputs on the speaker, like a jumper? Or should I just get the single voice coil to make it easier! Thanks! What is the maximum ceiling material thickness these will mount in? I'm hoping to use these on a tiled ceiling, and would therefore need to mount to about a 1" ceiling thickness. I'm looking to purchase a KBSOUND Premium system for our bathroom, but their speakers are not water resistant. Their system drives at either 8 ohms or 16 ohms. I just researched your ICE800TTWRS and it looks perfect! 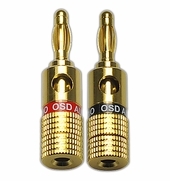 One question - if I opt for the single unit that plays in stereo (my preferred) is it 8 ohms of both channels? (So, so I hook it up as a stereo set, or do I drive it just off one of the KB outputs as mono to get the 8 ohms match? Assuming yes to the above, I'd prefer the 6.5" version mentioned in your video. What is the part number for that when I order, please? Hi Gerry, You would set it to 8ohms when running two channels (left/right) into it and using it as a single stereo speaker. 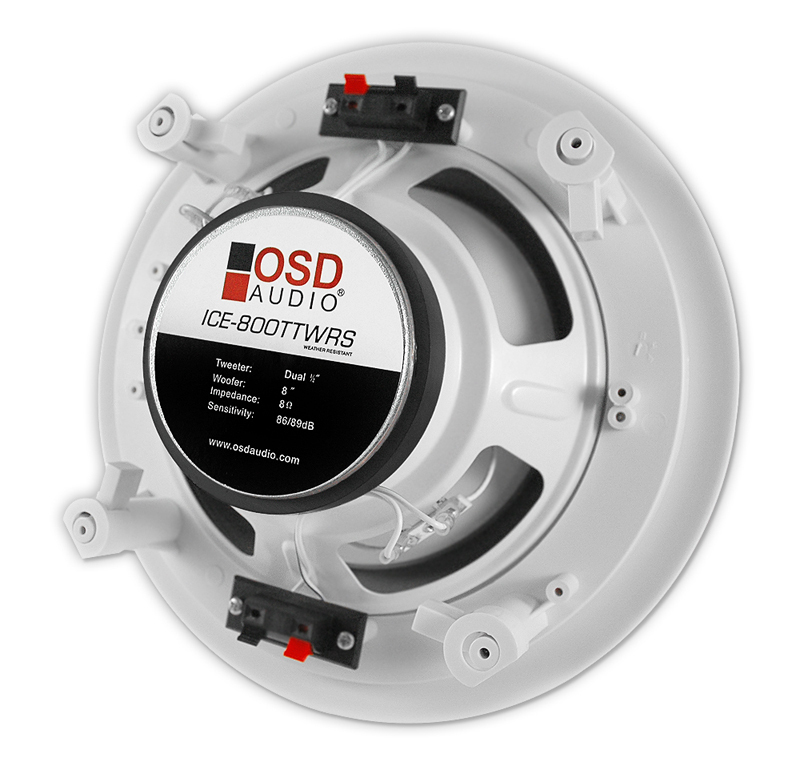 The ICE600TTWRS is the 6.5" version. It should be in soon! Hi Jay, Yes, you will need an amplifier or receiver to power these speakers. 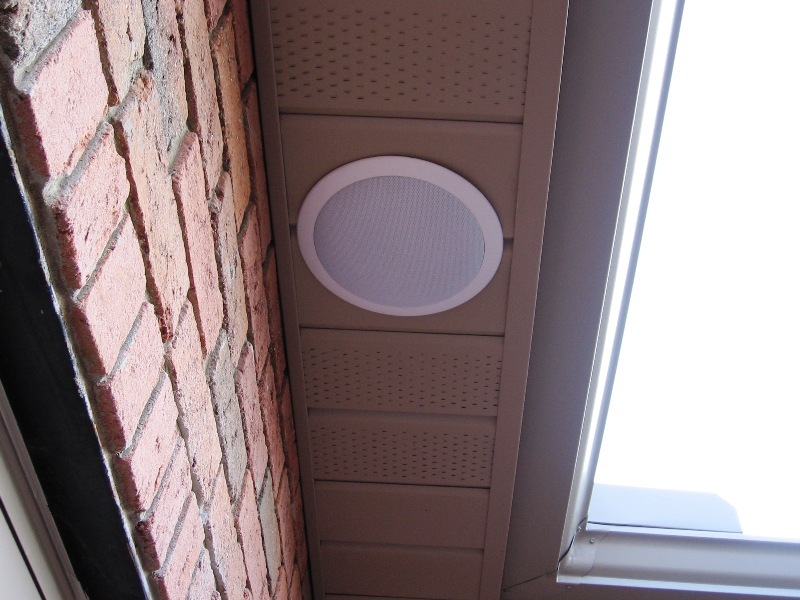 We do have self-powered outdoor Bluetooth Wireless patio speakers but they need to connect to a smart device such as a smartphone, tablet or computer. Some Smart TV's may work as well. Mark, You would want something like our AMP300 to power that many speakers. 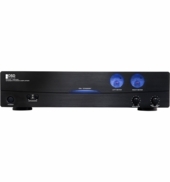 You can run a 4 zone speaker selector such as the ISS4 off each of the 2 zones on the AMP300. I purchased this speaker a coupl eof months ago for use in a steam shower/shower that I am installing. I have had several people question me about it and now I am beginning to second guess myself. Will this speaker hold up in that environment and if so are there additional precautions I should take for the installation? I have a 76' long patio and I want to install speakers in the ceiling. Would these be ideal? If so how many would you suggest and how far apart would they need to be placed? Hi Billy, Yes, these will work great and they put out stereo sound as long as you run 4-conductor wire to each speaker. I would run one speaker every 10-12 feet or so. Maybe a total of 6 or so. I only have 1 wire run to 4 different locations in my covered patio. Has anyone run a jumper from 1 input to the other on these speakers and had success? I'm sure this question is also dependent on the amp being used, but has anyone done this that has purchased these speakers? Thanks. Can this be installed in an existing soffit that has been prewired? Is any framing required to support the speaker? Does this speaker come in black? I have a 20'x22' covered patio that I am looking to install speakers for a surround sound setting for football games. Do these speakers work well in tandem or are they standalone? The house is new construction so I can install the wire now but looking for a good set of ceiling speakers to put in place. I am starting from the ground up. I do not have any equipment yet. I want 2 of these speakers on our new patio. I want an in wall volume control and the ability to play mp3, radio, and the TV through the speakers. What equipment would you suggest pairing the speakers with, and how would you suggest wiring it? 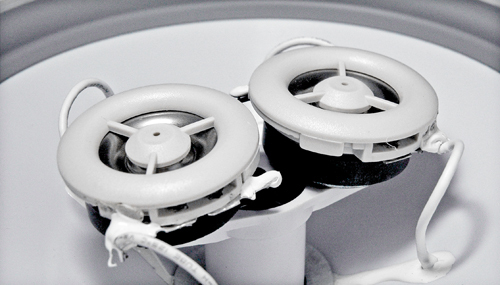 Is this ceiling speaker rust resistant? My last speakers rusted at the grill. We live near salt water at a beach house. I would like to install in a new bathroom I am building in my home. It is a small bathroom (5-1/2' x 8'). I'd like to only use 1 speaker. Is this model capable of playing stereo out of one speaker? 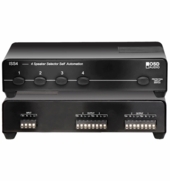 I have an MX-1260 that currently feeds 4 zones in my home. One of the zones is my patio where there are currently 2 8" speakers and an outdoor volume control for both speakers. Will I be able to replace both of my outdoor speakers with 2 of these or just 1? I wanted to hook two of these speakers up along with two single rock speakers to a Sony reciever for my out door music. 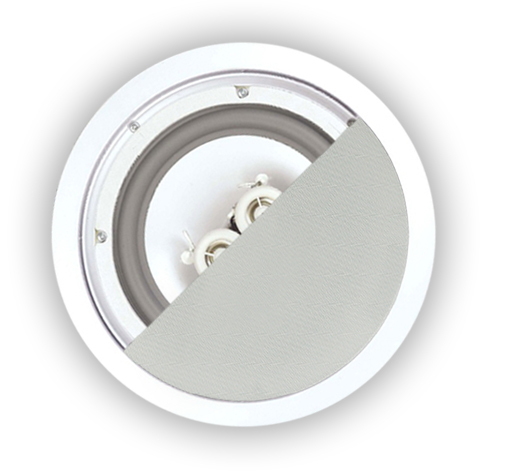 I would like to have one volume control for the two in ceiling speaker and one for the two rock speakers. What speaker selector and outdoor volume controls would you recommed? Would I run the speakers in parallel? What do you recommend? What material are the grilles made of? If i am using these speakers with your impedance matching volume control, can I hook 4 of these speakers to a single volume controller? What is the distance between mounting holes on this speaker? Can you use two on patio or only one because it's stereo ? What else would be good outdoor covered patio with rock speakers?